Are you a life science researcher at Texas A&M University in College Station interested in any of the following? Having the opportunity to win FREE door prizes like an iPad Mini and other fun goodies? If any of these appeal to you, mark your calendar now and come to the 14th annual BioResearch Product Faire™ Event on January 28, 2015 from 10:00-2:30! 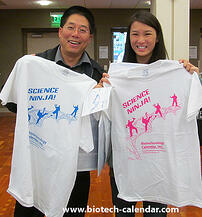 Researchers from past Biotechnology Calendar Inc. events happily show off their new Science Ninja t-shirts. The Texas A&M University BioResearch Product Faire™ Event is a wonderful opportunity for all researchers, lab managers, PI's, post docs, purchasing agents, and everyone else involved in the research process to find new products. Lab supply vendors from around the country bring their lab equipment to TAMU to make it convenient for you, the researchers, to see what new supplies are available and find products that will help with your research. Along with discovering new products, everyone who attends will have access to a complimentary buffet of delicious foods throughout the day, including bagels and cream cheese with coffee and tea in the morning and fruits, veggies, sandwiches, pizza, and lemonade in the afternoon. Everyone needs to eat, so take a break from your work to grab lunch with fellow researchers and see some new products while you're at it! Need more reasons to attend? There will also be door prizes and giveaways at the event. 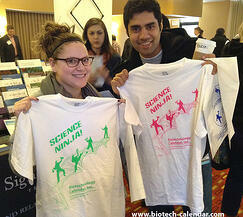 One of the most popular giveaways are the Biotechnology Calendar Science Ninja T-shirts, which can be seen in the pictures above. Researchers like to come year after year to collect shirts in different colors to proudly wear around campus. The chance to win an iPad Mini and other small goodies will also be available. All attendees have access to a lunch buffet of delicious foods. Last year, attendees came from 34 different research departments and 32 different on-campus buildings at TAMU, making the event a great place to interact with other researchers as well. Since Texas A&M University, College Station is such a large school, this event is a great opportunity to interact with other researchers to make new connections and find out what different labs have been working on. What better environment is there than one with free food, new supplies and hundreds of colleagues? 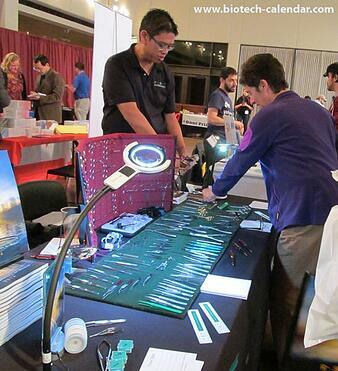 A TAMU researcher finds new products at the 2014 biotech event.